Not so much physically...more emotionally and mentally. I'm just so tired of grieving. I'm tired of being sad. I'm tired of every single thing in my life being tainted with a new heaviness. I'm tired of my monotonous life. I'm tired of trying to live in the past...doing everything we used to do, the same way we did it...desperately looking for Vienne around every corner only to find disappointment. I'm tired of being angry with God. But I'm also tired of feeling pressured and guilted into getting right with Him. I'm tired of tears. I'm tired of rehashing the same things over and over again in my head. I'm tired of my response to "how are you?" is always the same. I'm tired of the fact that my Girl is only a memory now...and constantly trying so hard to keep that memory alive. I'm tired of trying to accommodate other people's discomfort with my pain. I'm tired of the pain. I resonate with what you're sharing...I see it...the weariness. The very fact that you even have to be in such a place in this life emotionally and mentally (which trickles down to the physical) makes my heart so heavy...wishing I could carry some of it for you...something to lighten the load. But I know that's not possible. This is a beyond-heavy load that no one should ever have to carry. I can only pray that I don't do or say anything to increase your load...and please forgive me when I do. I know it is inevitable that it may happen. 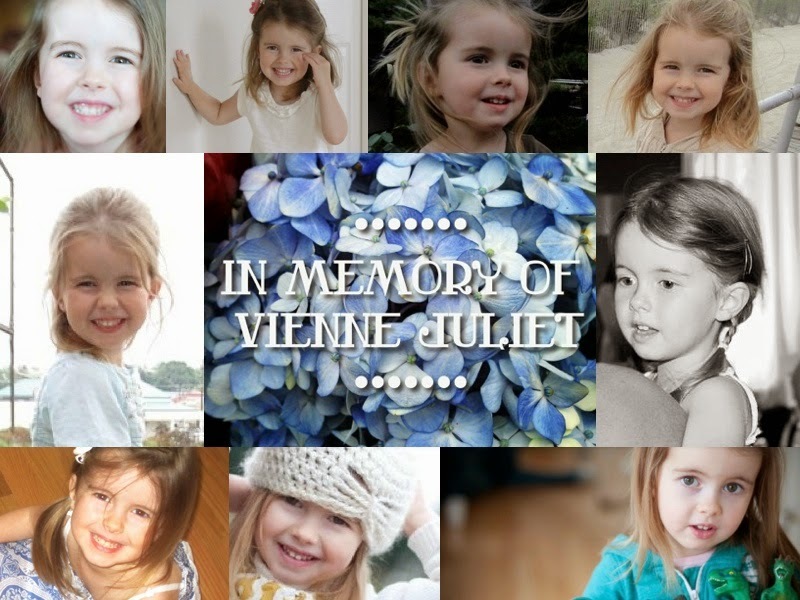 As much pain as I have over Vienne no longer being with us, I know it is only a fraction of yours. I admire you and Mark for continuing to get up each day, moving forward, little by little, day by day, breath upon breath, hope upon hope, holding fast to all the loveliness of Vienne, at the same time embracing all the loveliness that is Ivy. This picture of Vienne is sweet - it melts my heart, like all of them. I love you, my Dot. My heart goes out to you. May your weary heart and soul be comforted. Love you, and continually think about your family. No parent should ever have to carry the load you have. Praying the pain and exhaustion dwindles leaving only the happy memories! Thank you, Friends, for all of your encouragement and steadfast compassion. so sorry Jenny. I can't fathom what you're going through. Praying for peace of mind and heart and rest for your entire being. May Jesus breathe new life into your spirit today. Praying continually for you, Mark, Ivy and your extended family. Cannot imagine the depth of weariness you have experienced these last days and months. Wish there was something that could help, but just know I love you tons tons tons tons and am praying always for you and Mark. I love love love you dear friend. Your life is forever changed. Just as it was when Vienne was born. So, it is, in her leaving. I am so, so sorry. Are you the counselor found on this link? No, I'm not. I just wanted to share her name with you. Her willingness to talk (and get others talking) about the things that no one else wants to talk about (related to traumatic loss) is a breath of fresh air. You and your sweet family are in my thoughts and prayers!!! Well, thank you so much! I checked her out and it looks like she has a great ministry for those who grieve. I wish she was local to me! I found your blog recently and have just felt led to pray for you daily. Your sweet sweet baby girl surely was and even more so now, Angelic. In reading and watching videos, tears stream down my face as I see how beautiful her life was. But what's still beautiful is that her life is touching hearts, because she has certainly touched mine!! I'm praying daily for you Jenny and I know you have your precious girl Ivy to behold, but wow, am I excited for the day you, your husband, ivy and family are reunited with your Vienne in heaven, what a day that will be!!! You really do describe her so amazingly and you can just see her joyful heart radiate in every single picture. Your blog is surely helping keep her memory alive. Wow, Jenni, thank you for such sweet words of love and encouragement and compassion. This meant a lot to me today. Thank you, Susan. This was a good reminder. No, I do not take time for just myself often enough. Oh my God, this is profound. Your words are so poignant and real. I feel every nuance of your angst. Thank you ALL for such sweet and loving comments. I didn't expect such a response from such a little post. It means so much. What a sweet picture of your beautiful girl - right down to her little stocking feet. I marvel at how little ones seem so perfectly at peace when they sleep. I'm praying that you find peace and rest. Thank you, sweet Mary Alice.